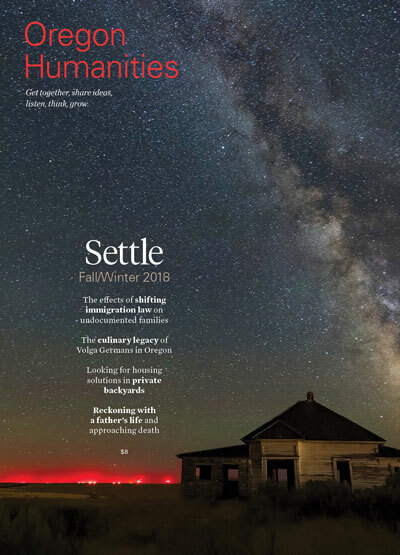 For the Summer 2019 issue of Oregon Humanities, we want to hear your stories, ideas, thoughts, and arguments on the word “adapt.” Share an experience about conforming in response to some sort of pressure. Tell us what it takes to alter and revamp a system that needs to change. Explore a historical or current event that shows the process and outcome of adaptation. We especially appreciate good stories and fresh ideas, particularly if they relate to challenging questions, diverse perspectives, and just communities. Tell us something we’ve never heard before. Show us something from a different angle. Make us feel, see, hear, smell the world anew. We welcome all forms of nonfiction writing, including all forms of essays and journalism. Please send drafts of personal essays, which should push beyond simple narrative and consider larger thematic questions. If you’re pitching a journalistic or researched piece, please send a proposal and links to your clips and tell us why you’re the person to write this story. Features generally range between 1,500 and 4,000 words. All contributors are paid depending on the length and complexity of the piece. Currently the magazine is distributed to nearly 14,000 readers. Work from Oregon Humanities has been reprinted in textbooks, the Pushcart Prize anthology, Utne Reader, and Best American Essays, and featured on public radio programs Think Out Loud and This American Life. If you are interested in contributing to this issue, please read past issues and the guidelines for writers. Please note that at this time, we only accept work by writers who reside in Oregon. Then, submit one proposal or one draft by Wednesday, March 13, 2019, to k.holt@oregonhumanities.org (preferred) or by post to Kathleen Holt, Editor, Oregon Humanities magazine, 921 SW Washington Street, Suite 150, Portland, Oregon, 97205. No phone calls, please.